Zigzag engraved patterns found on a 430,000 year old fossilized shell in Indonesia might be the earliest ever engravings by human beings, it is being suggested. This could be the first ever known instance of human beings creating a pattern deliberately. The fossilized mussel shells had been collected nearly 100 years ago but the patterns across them were discovered only recently. The oldest engravings by man previously found were 130,000 years old. “It rewrites human history,” said Dr Stephen Munro from the School of Archaeology and Anthropology at the Australian National University. Since the engravings are at least 430,000 years old, they are the creations of the long extinct species, Homo erectus. “This is the first time we have found evidence for Homo erectus behaving this way,” said Dr Munro. This indicates that Homo erectus species which preceded our species Homo sapiens were far more cognitively advanced than was previously thought. “This changes our view of the degree of cultural complexity characteristic of this fossil species and indicates that stone tools are a pale and incomplete reflection of the total complexity of techniques used at the time,” said biologist Josephine Joordens of Leiden University in the Netherlands. 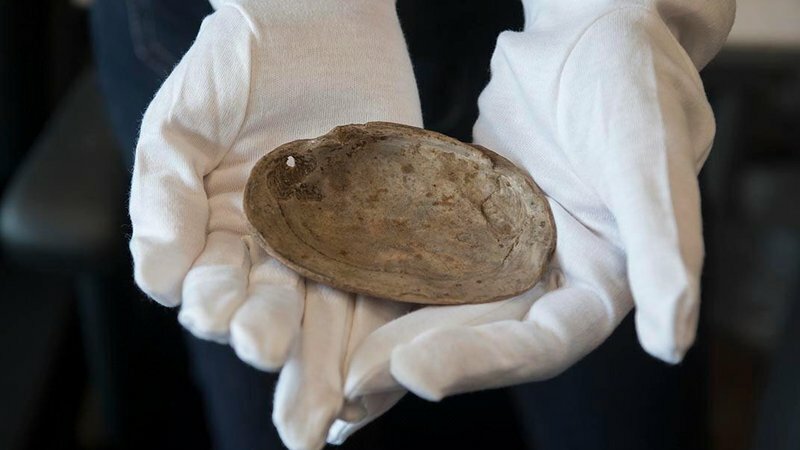 Dutch scientist Eugene Dubois had excavated and collected hundreds of fossilized mussel shells from Java in Indonesia in 1890s and then stored them in boxes in the Dutch city of Leiden. Munro took pictures of these shells in 2007 as a part of his research for his PhD, and those digital pictures helped see the engravings which were not visible to the naked eye. “Immediately when I saw the markings there I thought, those are human engravings, there’s no other explanation,” he said. One shell was fashioned into a tool with a smooth and polished edge, probably used as a knife or scraper. Another has the zigzag pattern, most likely produced by scratching the shell’s surface with a shark’s tooth that the scientists say represents the earliest geometric engraving known to exist, tells Reuters. It is not yet clear whether the engravings were a form of art or served some other purpose. John Shea, from Stony Brook University in New York, told NPR there was “nothing like it around for hundreds of thousands of years, and thousands and thousands of miles. If this is symbolic behavior by Homo erectus, then it’s basically the only evidence we’ve got for a species that lived for a million-and-a-half years on three continents,” he said. Homo erectus species is believed to have lived on our planet from about 1.89 million to 143,000 years ago. They were the first human species whose limb and torso proportions matched those of the present day man. These men from which we later evolved were omnivorous, knew about fire and used stone tools though their brains were believed to be much smaller than those of the modern day humans.